Choosing an efficient and aesthetic browser is an important choice when using the Internet, and Opera has a long history of adapting to the changes of the digital world. Publicly launched in 1996, Opera began as a research project and has undergone countless transformations over the past two decades to survive and thrive through the many deaths in the field of browsers. Today Opera offers its desktop/laptop browser, Opera Mobile, and Opera Mini, all of which have their own specifications and uses whether you’re using a computer or a smartphone. As Opera Mobile and Opera Mini are both available in Android app stores, it’s useful to take a look at their specifications and features to help users decide which one best fits their needs. Opera (sometimes called Opera Mobile for clarity) is in many ways quite similar to the full-fledged Opera computer browser, just available instead through the Android app store. This browser is designed for viewing secure webpages and sites in their most complete size on a mobile device. Opera Mobile is especially designed for smartphones, PDAs, and other portable devices that can support data-intensive web browsing. Importantly, this browser does not use Opera’s compression technology by default, meaning it will run websites at their maximum size and with all their data. It is possible to turn on a data-saving mode, or Opera Turbo, to cut down on loading time – particularly helpful when users aren’t on Wi-Fi. Opera Turbo will trim pages by up to 50% of their data, lightening the load considerably. Opera Mobile also comes with a lot of the brand’s features that will automatically quicken loading time. The headliner of these features is Opera’s built-in ad-blocker, which the brand heralds as the first built-in ad-blocker on a major browser. This is claimed to save on page loading time by as much as 90%. As a browser built for full-screen viewing, Opera Mobile highlights its news feed. This option lets users scan through news channels within the browser. They can also subscribe to news sources they like to get updates and save stories for reading later, all of which fits into Opera’s design plan to make their mobile browsers one-stop-shop apps. Through its decades in the market, Opera has seen the rise of many of the digital age’s security issues, so it’s no surprise that it’s built a special privacy feature into Opera Mobile. For users concerned about the number of permissions they have to give to apps in order to use them, Opera Mobile can run mobile sites as though they were apps, even adding them to the phone’s home screen and creating push notifications. This helps alleviate the issue of giving varying permissions to a wide variety of apps while still getting updates. For those smartphone owners concerned with readability, Opera Mobile’s focus on desktop-mode browsing has led to a flexible zoom feature and the ability to use multiple windows. While Opera Mini only has two zoom modes, Opera Mobile allows the user to zoom from 25% up to 200% of the orginal page size. More than one window can also be in use at once, mimicking the interface of a desktop or laptop. As a bonus to the zoom option, Opera Mobile wraps text when it extends off-screen. A final feature of Opera Mobile is its Sync option. This lets users create an account to save shortcuts, bookmarks, tabs, and so on to carry across devices when they’re on the go. Where Opera Mobile capitalizes on full-screen reading and news, Opera mini puts speed first. It utilizes the company’s compression technology, allowing it to load pages much faster than Opera, but in mobile mode instead of desktop mode. It also has an “extreme” data saving mode, intended to be as light as possible on a mobile connection to let users access all content and media even off of Wi-Fi. To put the data saving into numbers, Opera Mini’s compression cuts page data down to 10% of their true size, a literal fraction of Opera Mobile’s significant 50% cut. Opera Mini is able to handle this compression technology because, unlike Opera Mobile, it’s a cloud-based browser. It works by requesting data from Opera’s servers, which compress the data before sending it to the phone browser. Because the servers handle the data compression, the process can be done much faster than if the browser itself had to do it. Complementing the fast compression tech and the data saving mode is the return of the ad-blocker, which features on all of Opera’s browsers. The ad-blocker is key to stopping a lot of scripts before they can start to bog down pages. Opera Mini’s features really start to diverge from its mobile sibling when it comes to the presentation of downloads and notifications. No longer focusing on the news feed, this browser instead scans pages to look for downloadable content, especially video. This is then made clickable, and the downloads store to Opera Mini itself, keeping them from disorganizing the phone’s file system. Similar to the streamlined downloads page, Opera Mini’s start page is able to be customized to the user’s interests. Described by the company as “pockets” on a leather satchel, categories of interests can be chosen for the home page, which Opera Mini will then use to create of feed of content. This page also contains favourited sites all in one visual location. For users who can’t be separated from social media, Opera Mini offers a Notifications bar for Facebook push notifications. Unlike the downloads and start page, this feature is part of Android’s “notification drawer,” or the interactive bars that run across the screen informing the user of various app updates. There are two special modes on Opera Mini that are helpful to users with any number of needs – Incognito tabs and Night Mode. Incognito tabs don’t save anything to your history, although for those unfamiliar, data can be still recorded by IPs and the sites visited themselves. These tabs are useful for when there’s no need to clog up phone history, or when there’s sites that just don’t need to be part of the history for whatever reason. Night Mode is a screen setting designed to reduce eye strain, especially for people using their phone late at night before bed. When switching to this mode, the phone will start using red-orange light, which is much less stimulating than the default blue-violet light. Opera Mini shares the Sync feature with Opera Mobile, aiming to make traveling and commuting as easy as possible. According to Opera itself, ease of travel is one of the main purposes of Opera Mini, and Syncing emphasizes that goal. 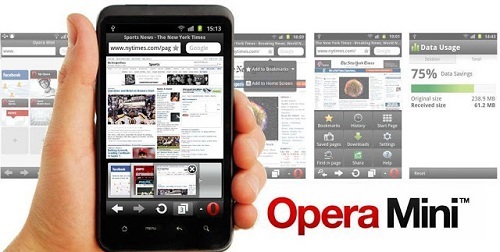 Opera Mobile and Opera Mini are close siblings in the world of browsers. As lightweight Android apps, they both emphasize fast loading and their adblocking capabilities. The main divergence between them comes from how they display webpages. While Opera Mobile is able to display desktop-mode pages on mobile devices at a fraction of the speed, Opera Mini is cloud-based and compresses mobile sites for a massive loading time reduction. Opera Mini also highlights a centralized mobile app with a strong homepage and download feature, but Opera Mobile appeals again to heavy content readers with its news feed. Kelsey Robarts. 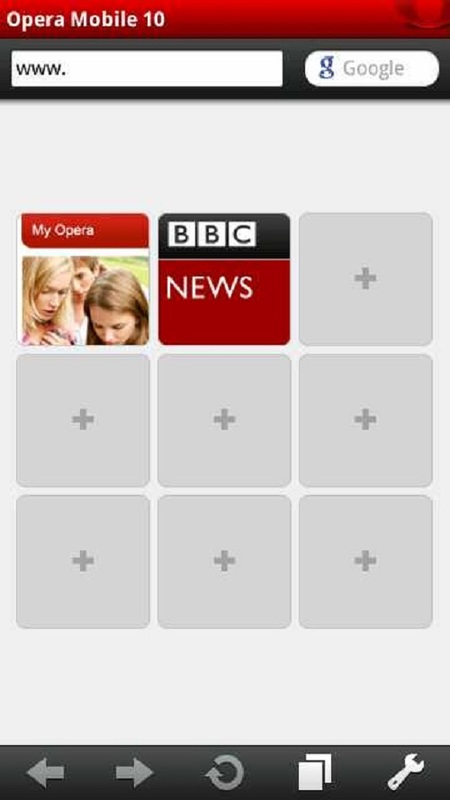 "Differences Between Opera and Opera Mini." DifferenceBetween.net. October 26, 2017 < http://www.differencebetween.net/technology/internet/differences-between-opera-and-opera-mini/ >.